Fran Tarkenton rewrote the NFL quarterback paradigm as he became the first dominant passer that could also excel at running the football. By the end of his long career, he was the greatest statistical quarterback the sport had ever seen. 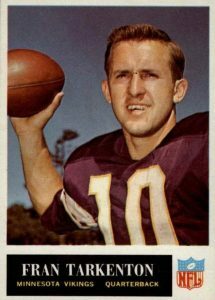 Tarkenton also won the hearts of Minnesota Vikings fans as the franchise's first great quarterback and he still holds many of the team's QB records. 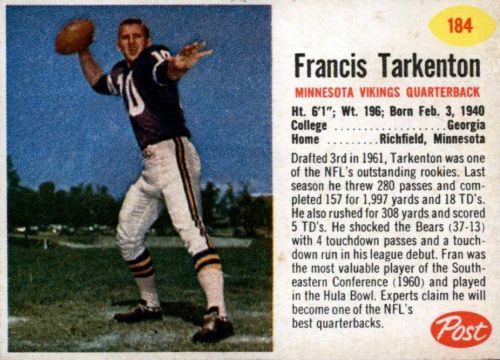 This list features some of the very best Fran Tarkenton football cards, including several appearances from both Topps and Philadelphia sets. Tarkenton seemed to grow more dominant with age during his amazing 18 seasons in the NFL. He led the Vikings to three Super Bowl appearances in his final six seasons and won the Most Valuable Player award in 1975. Although the Purple People Eaters never captured the Lombardi Trophy, Tarkenton retired as the NFL's leader in passing yards, touchdowns, QB rushing yards, and wins. In 1986, Fran Tarkenton became the first Vikings player to be selected for the Pro Football Hall of Fame. Shop for Professionally Graded Fran Tarkenton cards on eBay. Given his considerable on-field success, collectors have been treated to many cardboard choices to celebrate his career. Tarkenton has been a frequent signer in high-end football card sets and he is often paired with other players to create remarkable combination autographs. In 2015 Panini National Treasures, fans can find dual autographs of Tarkenton and Vikings quarterback Teddy Bridgewater, while in 2010 Donruss Elite Football he was paired with Brett Favre during his brief stint with the Vikings. Collectors on a more limited budget can turn to 2008 Upper Deck Masterpieces that features a painted card of Tarkenton handing off to Adrian Peterson, every Viking fan's dream. In 2001 Donruss Classics, a Tarkenton card in the Hashmarks subset offers his signature combined with a swatch of AstroTurf, making an interesting autographed relic. More recently, Fran was featured in both 2016 Panini Classics and 2016 Panini Absolute, giving fans an opportunity to pick up new base cards and autographs. As you may note from the list, Tarkenton collectors have three rookie/first-year cards to choose from which is uncommon for players of his era. This gives fans several different opportunities and price points to build their collection. Keeping that in mind, value is the main component used in placing cards on the list. The 1968 Topps Football posters, which are similar to the baseball version also issued in 1968, originally came folded into smaller gum packs. Due to their packaging, the posters were often damaged as kids frequently folded and unfolded each poster. 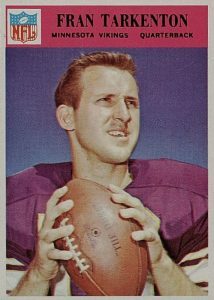 Sixteen posters were issued in total and Tarkenton is shown as the New York Giants quarterback although he is clearly wearing a Vikings uniform on the poster. Fran was traded to the Giants at the end of the 1967 season but would be traded back to the Vikings in 1972 and his career resurgence began shortly thereafter. Philadelphia Chewing Gum issued their third of four football sets in 1966 that featured NFL players, while Topps covered the AFL. The checklist divided teams alphabetically with the Vikings taking up cards #105-117. 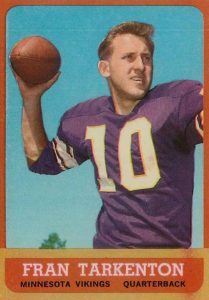 The set also assigned a single color for each team with Tarkenton and the rest of the Vikings sharing a hot pink design. The reverse side of the card features a photograph of Atlanta Falcons defensive end Maury Youmans and asks fans to identify him with the answer found on card #129, enticing collectors to piece together the entire set. 2000 Fleer Greats of the Game features an amazing checklist of retired players with many first-time signers present. Tarkenton is shown in a photo from his second stint with the Vikings which saw them reach Super Bowl VIII, IX, and XI, losing to the Dolphins, Steelers, and Raiders. 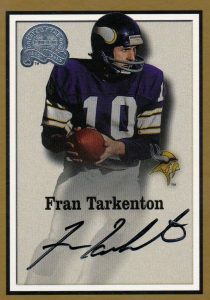 Tarkenton's signature is memorable for its reversed "F" in "Fran" and capital "T" in "Tarkenton" that both resemble the number "7." He also frequently ends the signature with a loop without spelling out the final letters of his last name. Overall, the four Philadelphia sets didn't vary too much in design as they generally feature close-up photography with player names, team, and position on the bottom or top of the cards. Tarkenton's 1965 Philadelphia card showcases him throwing the football toward the camera and the reverse side features a coin scratch-off quiz. Cards that are undamaged from the quiz are held at a premium by collectors. 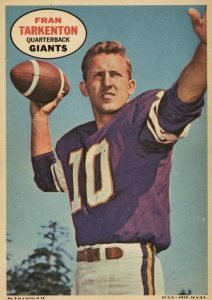 My personal favorite Tarkenton base card is his appearance in the first Philadelphia set from 1964 as he looks determined and ready to throw a pass. The product introduced cards highlighting a notable team play that included a photograph of the team's coach. The Viking's play, drawn up by coach and Hall of Famer Norm Van Brocklin, is appropriately enough a 30-yard pass from Tarkenton to receiver Bob Reed. The value drop on a Hall of Famer's second-year card versus their rookie gives collectors on a budget a great opportunity to scoop up an early card at a great deal. This is the case with Tarkenton's 1963 Topps card. With its unusual amount of cards, the 170-card checklist resulted in many cards being short-printed because the numbering didn't match Topps' standard printing plates. The entire roster of the Eagles, Browns, Steelers, and Cardinals are considered less common because of this. Tarkenton's first Upper Deck certified autograph can be found in the renowned 1997 Upper Deck Legends set but that appearance has proven to be a little too uncommon on the secondary market to be included in this guide. However, another Upper Deck Legends entry gives fans a well-designed card that puts the focus where it should be, on the autograph. 1999 Upper Deck Legends devotes almost half of its design to the signature area and most signers, including Tarkenton, took full advantage of it. The first of three Tarkenton cards produced following his rookie season is his $1 Topps Bucks card. The Bucks were inserted one per box into 1962 Topps Football and vary in denominations of $1, $5, and $10. Tarkenton's $1 bill is printed with green ink on white paper. It also features a sketch of the Vikings' old Metropolitan Stadium which was demolished in 1985 and is now the location of the Mall of America. Some of the 1962 Post trading cards were issued on the back of cereal boxes from Post's less popular brands and so they were never cut out and saved by collectors. Tarkenton's card doesn't appear to be one of those rarities but it does hold its value as an alternate rookie card to his famous Topps rookie. 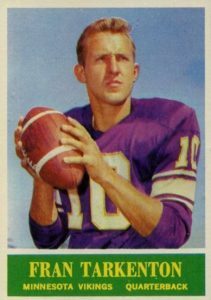 As it mentions on the front of the card, Tarkenton attended the University of Georgia where he led the Bulldogs to the SEC title in 1959 and won the Orange Bowl. 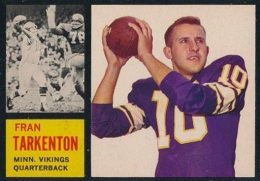 Tarkenton's most popular rookie card is this multi-paned card from 1962 Topps. The set stands out as one of the few black-bordered trading card sets which also makes it one of the most difficult sets to collect in a high condition as the corners are easily chipped. Tarkenton made an impression straight away in his rookie season by scoring four touchdowns in his first NFL game. This was a mark that would not be matched until 2015. Given the 1962 Topps condition problems, it is not surprising that near-mint graded copies top $600 at auction while mint copies move the prices into the thousands. FRAN TARKENTON MINNESOTA VIKINGS QB - 1979 TOPPS FOOTBALL CARD #200 - EXMT COND. 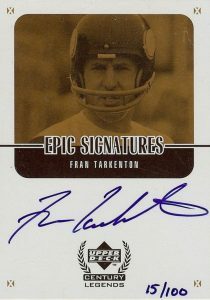 FRAN TARKENTON 1999 UD GOLD CENTURY LEGENDS EPIC SIGNATURES AUTOGRAPH #41 100 !! Vikings Fran Tarkenton Impeccable Numbers auto 10 10 JERSEY NUMBER! (1 1)!!! !